Continental cuisine typically refers to the cuisine of the European continent, especially the varied cuisines of Western Europe. While classic cookbooks equate continental cooking with meat, butter and egg-thickened sauces, it also includes fresh salads, roasted vegetables, sumptuous soups and grain dishes such as polenta and risotto. Continental techniques and ingredients adapt well to vegetarian, and even vegan, dishes. Continental cuisine is a wide umbrella covering dozens of regional cooking styles. "Sundays at Moosewood Restaurant," a classic collection of ethnic vegetarian recipes, includes recipes from Provence, Greece and Italy. You'll find specialty cookbooks for French vegetarian cooking, Italian vegetarian cuisine and Spanish vegetarian cooking. Continental cooking includes Mediterranean cuisine, and many classic vegetarian dishes find their origin in the "peasant food" and ingredients of the Mediterranean regions. Fresh vegetables are a mainstay of many continental vegetarian dishes. In his introduction to Provencal cooking in "Sundays at Moosewood," Kip Wilcox writes that residents of Provence consider fresh vegetables to be so essential, they tuck vegetable gardens into every stray corner. 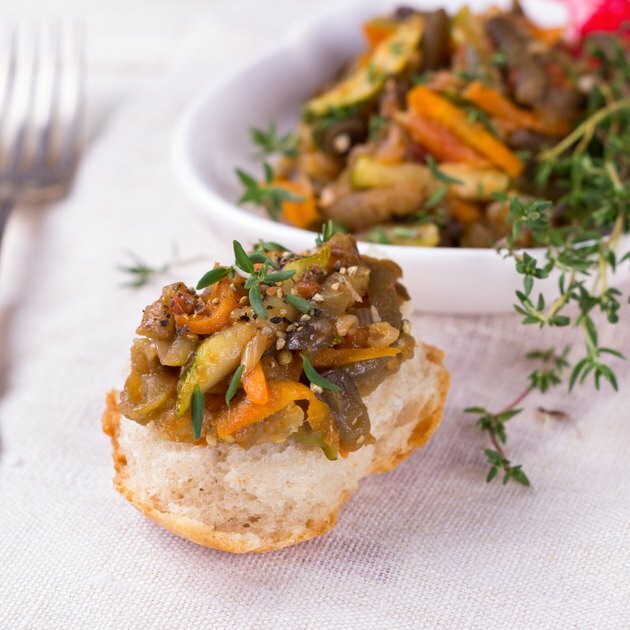 Hot or cold, continental vegetarian dishes feature tomatoes, eggplant, cucumbers, onions, potatoes, carrots, beans and peas. Salads include greens far beyond the traditional lettuces--spinach, dandelion greens, radicchio and other spring greens all make their appearance, alone or in combination. Dried legumes--beans, lentils and peas--feature heavily in main dish casseroles, loaves and soups. Mushrooms, particularly porcini and portobello mushrooms, add texture and flavor to soups, salads, appetizers and main dishes. Rice, wheat, barley and other grains are also important in continental vegetarian cuisine. Most meals include bread, pasta, rice or polenta, usually made with whole grains. Desserts, breakfast and snacks often include fresh berries, apples, pears, peaches and melons, either alone or in melange. For non-vegans, continental cooking includes fresh cheeses such as ricotta, chevre and cottage cheese, and a variety of aged and semi-aged cheeses including Provolone, Asiago and Parmesan. In addition to the main ingredients, continental cooking makes use of a number of condiments and spices. Olive oil is ubiquitous, both as an ingredient and as cooking oil. Important spices in continental cooking include basil, oregano, chervil, parsley, fennel and anise. Continental cooks use garlic, onion and chives liberally, and southern Mediterranean cuisines often include lemon and mint in dressings, sauces and condiments. Many classic continental dishes are vegetarian by nature, while others are easy to adapt to a vegetarian table. Risotto, an Italian rice dish, serves as a base for many other dishes. Vegetables, brushed with olive oil and roasted or grilled, take on regional flavors depending on the spices or sauces used with them. In many regions, cooks slice polenta, a corn meal porridge, and fry it or roast it as a base for sauces and vegetables. A typical continental meal includes a starter or appetizer, a main dish, one or more side dishes and a dessert. The meal should include a grain, fruits or vegetables, a protein and some fat. A simple meal might include a salad of greens with tomatoes or berries tossed with vinaigrette dressing, hearty bean soup and whole grain bread. Pair pan-roasted vegetables with crusty bread spread with tapenade, or serve thick slices of grilled portobello mushroom with chilled tomato soup and croutons. If you don't eat dairy or eggs, make a special point of including whole grains, legumes and nuts to make sure that your meals provide the essential fatty acids and vitamins that your body needs. What Types of Food Do They Eat in Italy? How Many Calories are in Thai Food?